With 40+ stores, Argos is one of Ireland's leading retailers, offering more than 25,000 products online and in-store. Famous for its catalogue and its amazing prices, Argos is the store that has something for everyone, and at the right price! 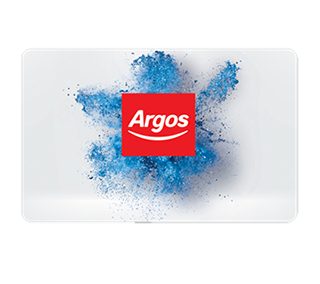 Argos covers a massive range of departments, including Kitchen & Laundry, Home & Furniture, Garden & DIY, Sports & Leisure, Health & Personal Care, Home Entertainment Video, Games, Photography, Office, PCs & Phones, Toys & Games, Nursery, Jewellery & Watches, Gifts & Hobbies. How it Works: Use this gift voucher on AllGifts.ie to order gift cards for use in any Argos, Argos Extra and Homebase store in the Republic of Ireland. Or you can swap this voucher for any other gift or voucher listed on AllGifts.ie. Argos gift cards are posted out free of charge once ordered. 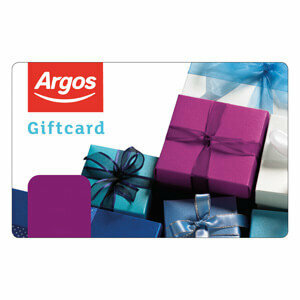 Argos gift cards are available in denominations of €25 (e.g. €25, €50, €75, €100 etc). Minimum gift card value is €25. With 40+ stores, Argos is one of Ireland's leading retailers, offering more than 25,000 products online and in-store. Famous for its catalogue and its amazing prices, Argos is the store that has something for everyone, and at the right price! Argos Gift Cards are posted out free of charge, normally within 5 working days.